Washington, DC and Montreal, Quebec - Celebrities, particularly female celebrities, are routinely criticized about their appearance—indeed, celebrity “fat-shaming” is a fairly regular pop-cultural phenomenon. Although we might assume that these comments are trivial and inconsequential, the effects of these messages can extend well beyond the celebrity target and ripple through the population at large. Comparing 20 instances of celebrity fat-shaming with women’s implicit attitudes about weight before and after the event, psychologists from McGill University found that instances of celebrity fat-shaming were associated with an increase in women’s implicit negative weight-related attitudes. They also found that from 2004 - 2015, implicit weight bias was on the rise more generally. Explicit attitudes are those that people consciously endorse and, based on other research, are often influenced by concerns about social desirability and presenting oneself in the most positive light. By contrast, implicit attitudes—which were the focus of this investigation—reflect people’s split-second gut-level reactions that something is inherently good or bad. The research is published in Personality and Social Psychology Bulletin, a journal of the Society for Personality and Social Psychology. Bartz and her colleagues obtained data from Project Implicit of participants who completed the online Weight Implicit Association Test from 2004 to 2015. The team selected 20 celebrity fat-shaming events that were noted in the popular media, including Tyra Banks being shamed for her body in 2007 while wearing a bathing suit on vacation and Kourtney Kardashian being fat-shamed by her husband for not losing her post-pregnancy baby weight quickly enough in 2014. 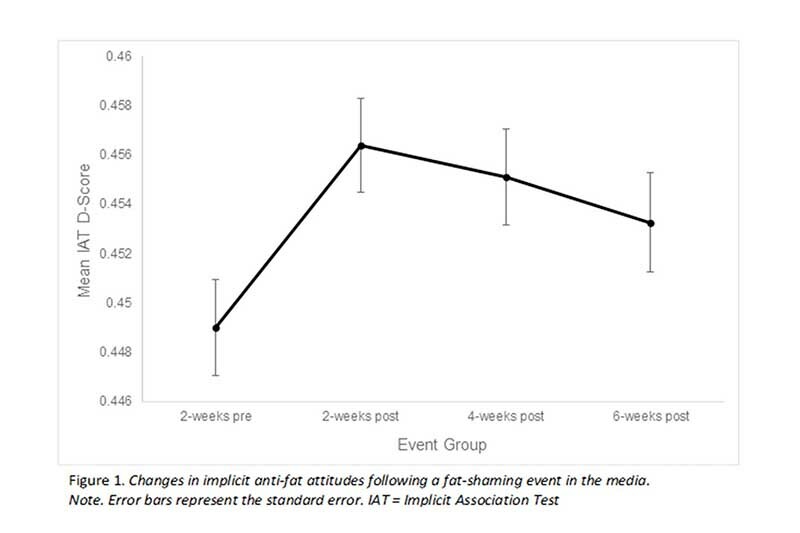 They analyzed women’s implicit anti-fat attitudes 2 weeks before and 2 weeks after each celebrity fat-shaming event. Examining the results, the fat-shaming events led to a spike in women’s (N = 93,239) implicit anti-fat attitudes, with more “notorious” events producing greater spikes. While the researchers cannot definitively link an increase in implicit weight bias to specific negative incidents in the real world with their data, other research has shown culture’s emphasis on the thin ideal can contribute to eating disorders, which are particularly prevalent among young women. “Weight bias is recognized as one of the last socially acceptable forms of discrimination; these instances of fat-shaming are fairly wide-spread not only in celebrity magazines but also on blogs and other forms of social media,” says Amanda Ravary, PhD student and lead author of the study. The researchers’ next steps include lab research, where they can manipulate exposure to fat-shaming messages (vs. neutral messages) and assess the effect of these messages on women’s implicit anti-fat attitudes. This future research could provide more direct evidence for the causal role of these cultural messages on people’s implicit attitudes. Citation: Amanda Ravary, Mark W. Baldwin, and Jennifer A. Bartz. Shaping the Body Politic: Mass Media Fat-Shaming Affects Implicit Anti-Fat Attitudes. Personality and Social Psychology Bulletin. Online before print April 15, 2019. Open Access: The data reported in this paper are available in the Supplemental Materials and archived at the public database Open Science Framework (https://osf.io/iay3x). Funding This research was supported by a Fonds de recherche du Québec—Société et culture (FRQSC) Team Grant (FRQ-SC SE-#210323).